I get asked this question now and then, so I thought a little discussion of this vital topic wouldn’t hurt. Used to be, when trying to explain clawhammer banjo, I’d refer to Grandpa Jones, once a star of the TV show Hee Haw. Now that Grandpa Jones has passed on to the barn dance in the sky and Hee Haw is long off the air, it’s hard to think of a national star who plays in this style. But although clawhammer banjo pickers are not found on the front cover of Time or Rolling Stone (not YET anyway), they can be found on front porches and at summer old-time music festivals, usually backing up an old-time fiddler. So where did clawhammer banjo come from? The first Americans to play clawhammer banjo (or any banjo style for that matter) were black slaves. They brought both the banjo itself and the way to play it from West Africa. Once in America, the banjo became the instrument most associated with African-Americans. It wasn’t long before White musicians, such as Joel W. Sweeney, were copying the banjo playing styles of African-Americans and teaching them to banjo players far and wide. During this period, clawhammer was often known as the “stroke” style, although it was also known as framming, frailing, banging, thrashing and thumb-cocking the banjo. In the 1840s, a style known as Minstrel Music developed in New York City but soon spread all over the country. Performers such as Daniel D. Emmett dressed in ill-fitting patchwork clothing and smeared their faces with burnt cork to emulate the speech, mannerisms, dances and most importantly, the music of old plantation days. Minstrel shows not only featured banjo picking, but also dances, jokes, stump speeches and skits and was the most popular form of entertainment until well past the turn of the 20th century. Starting in the mid 1920s, on Saturday nights rural folks would hunker down around their old Philco radios to tune in to the most popular program of the day, the Grand Ole Opry. Everybody’s favorite was Uncle Dave Macon, who was billed as “The Dixie Dewdrop.” A natural-born entertainer, Uncle Dave not only played clawhammer banjo, but he played it in more ways than Carter’s got Little Liver Pills! He picked it, he strummed it, he rapped it, and he even twirled it! Nowadays, most pickers content themselves with playing just one of two styles: clawhammer or bluegrass banjo. Pity. You may be wondering why clawhammer is the poor stepchild of bluegrass banjo pickers, and remains in the shadows of its more famous cousin. There is one short word to explain that: Earl. For those familiar with bluegrass music, “Earl” is short for Earl Scruggs. Starting in the mid-forties, Earl re-energized the banjo with performances on the Grand Ole Opry as part of Bill Monroe’s band, The Blue Grass Boys. After hearing Earl, people from all across the country started to take their grandfather’s old banjo out from under the bed and actually started to play them. Earl’s contribution was in refining and improving a style of three-finger banjo picking that had been played in the early ‘twenties by North Carolina banjo players such as Charlie Poole, Dock Walsh, and others. (See “The Banjo in North Carolina” by C.E. Heaton). Earl’s dynamic performances of tunes such as “Foggy Mountain Breakdown” and “Cripple Creek” riveted his fans and started a new wave of interest in picking the banjo with three fingers. In truth, there hasn’t been a banjo player come along in over fifty years who has grabbed people’s attention like Earl Scruggs did. Clawhammer banjo is a somewhat more laid back style, so perhaps it hasn’t drawn national attention like 3-finger or Scruggs style, as it is often called. 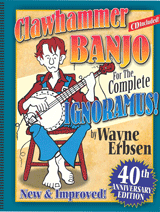 Watch a Video Clip of Wayne Erbsen… Teaching the Clawhammer Lick on the banjo, Teaching Double C Tuning on the banjo, playing minstrel banjo. Thank you for this thorough explanation!! I am strongly contemplating the idea of buying a banjo and all sorts of doubt came to me about what is clawhammer, what is bluegrass. Is it a style of playing the banjo or is that they are physically different! Well I got my answer! I’m from the Caribbean and I’m very interested in learning banjo. Thank you for this post!! I seem to play a. Rolling. Clawhammer style. Check out Sarah Jaroz. She is an amazing artist and playing Clawhammer style. Abigail Washburn plays some awesome clawhammer with Bela Fleck. Would the end of “The Beverly Hillbillies” theme song be considered “Clawhammer” style? Nope. That’s bluegrass banjo picking.